Hi there – how long has it been now? Months? It’s been at least two months, right? *sigh* We are so, so sorry about that, folks. It’s just that we got caught up in a lot of harvesting at the end of last season, and all that buzzing around – I’m talking three-times-more-than-the-national-average-tomato-yield type of buzz – tends to drain even the sturdiest of men eventually. Forgive us, and accept this tomato fun fact as a token of our apology: we got yields that were more than THREE TIMES higher than the national average! Okay, okay, enough of the bragging. Let's get down to business. If our time here in Nigeria is anything to go by, we know that #TeamTomatoJos thrives on new challenges and exciting opportunities – these are our driving forces. So with the tomato season drawing to a close and the imminent arrival of the rainy season, the team convened and agreed that it was the perfect time to refocus our enthusiasm, for the meantime, on something other than tomatoes: maize. But why maize? you may ask. Well, besides being delicious, maize is a cover crop, and cover crops serve many purposes. Planting a cover crop is a great way to prepare your tomato soil in the off season. Cover crops can create income, reduce erosion, replenish nutrients in the soil, and even break up life cycles of unwanted pests. Most importantly, they help water movement through the soil by changing the soil structure. Soil texture can never really be altered, but the soil structure can, and it is important to ensure your crop’s roots access the water they need when the time is right. Cover crops can create a healthy soil by allowing water to permeate the soil freely. Most people would argue that maize was made for tropical regions like sub-Saharan Africa: it utilizes sunlight effectively and, well, we’ve got sunlight in abundance. In Nigeria, specifically, maize is one of the most important grains, not only because so many farmers take part in its cultivation, but also because of its economic value, and the fact that it is an all-round a-MAIZE-ing crop – just ask the next industrial consumer, animal feed producer, or child with a bowl of Nestlé cornflakes, that you see. Nigeria is after all Africa’s largest producer of maize, with almost everyone getting involved, no matter how big or small the patch of land! In the rainy season, farmers will make use every patch of land they can find! But of course we’ve also supplemented our fields by using subsurface drip irrigation. Drip irrigation is considered to be the most efficient irrigation, capturing 85% of the effective root zone area of each plant. It can also be used for fertigation (yes, this is an actual word). Fertigating will improve our yields and increase the effectiveness of our fertilizer – this means that we can use less. On our maize, we are using fertigation to apply the urea in small doses each week. Rather than letting the nitrogen leach away, we are applying just what the plant needs, every week. This consistency and detailed efficiency leads to higher yields. 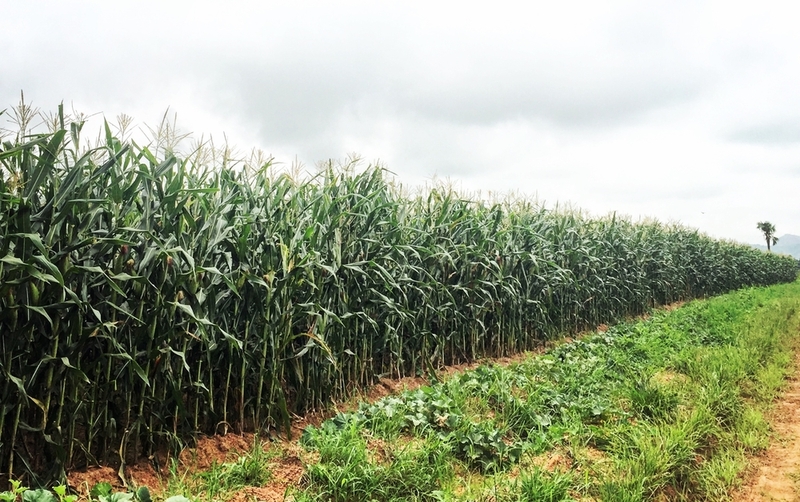 Local farmers tend to fertilize only twice: once at the beginning of the season, and once when the maize is about knee-high. After that point, it gets really hard to walk around in all that maize! With a drip system in place, we can continue to fertigate much further through the life cycle of the maize plant. Now we know what a lot of you are thinking… with all this talk about maize, are we giving up on our first love? Fear not, enthusiastic readers! This project does not mean that we intend to ditch tomato – not now, not ever. If anything, we are probably too eager for the upcoming season to be idle during the off season. It doesn’t hurt to try out new things and gain experience. And we intend to pass on this experience to smallholder farmers with an impromptu mini field day next week!